It is a unique masterpiece of Jozef Pekara, who is a native of Rajecké Teplice. The creche, which is 8.5 m long and 3 m wide, is one of the largest carved crèches in Europe. 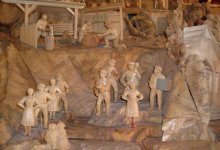 The master carved the whole in linden, depicted the life style, culture and crafts of Slovakian people. All figures are moving, working and enjoying themselves.